Most proud cat owners readily admit to spoiling their precious feline, and if you're someone who fits that description, then these Personalized T-Shirts is for you. 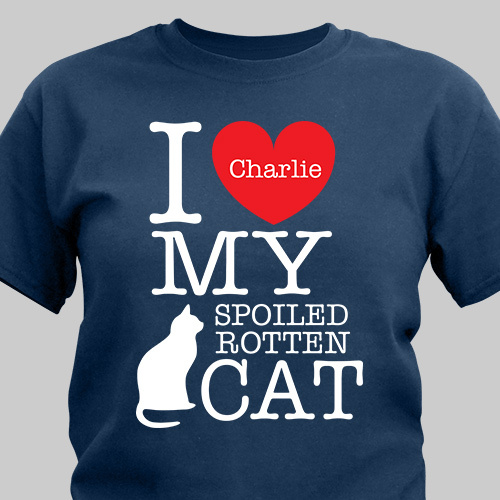 Rock this Personalized Shirt with pride and let the world know how much you adore your cat. This Spoiled Cat design is printed on our 100% cotton t-shirts, machine washable in adult sizes S-3XL. Free personalization of any name is included. 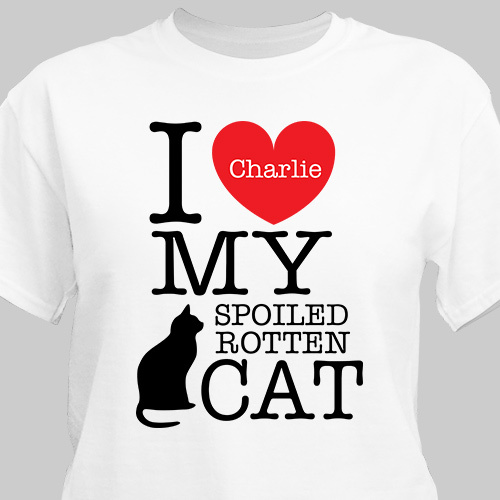 I LOVE MY NEW PERSONALIZED WITH MY NAME SHIRT THAT SAYS I LOVE MY SPOILED ROTTEN CAT. IT IS WELL MADE AND FITS PERFECT. MY CAT LOVE IT TOO. She is going to love it. Additional Details Give this t-shirt as a personalized gift to any friend or family member who can't get enough time with their cat. They'll love the personalized touch of having their cat's name on the shirt!